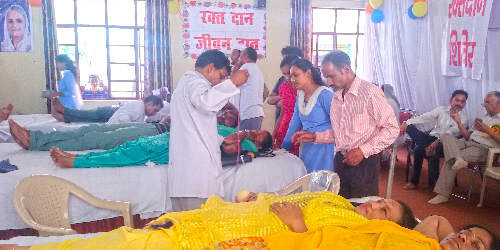 With the divine blessings of Satguru Mata Savinder Hardev Ji Maharaj, a blood donation camp was organized on June 18, 2017 in Sant Nirankari Satsang Bhawan, Ponta Sahib in Himachal Pradesh, where 273 donors including 61 women donated their blood. A team of 6 doctors and paramedical staff headed by Dr. Sandeep Malhotra Senior Resident from Indira Gandhi Medical College, Shimla and 3-member team led by Dr. Nishi Jaswal from Dr. Y.S. 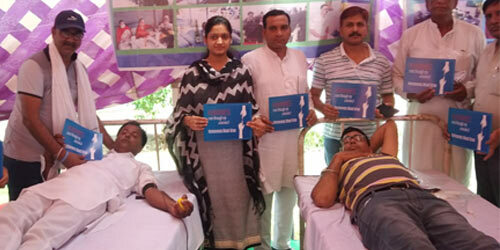 Parmar Medical Collage, Nahan collect the blood. Organised under the auspices of the Sant Nirankari Charitable Foundation, the camp was inaugurated by Km. Soumya Sambasivan (IPS), Superintendent of Police, Sirmaur. Inspired by the enthusiasm of the donors, Km. 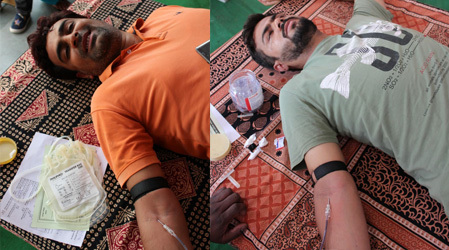 Soumya and Deputy Superintendent of Police Shri Pramod Chauhan also donated their blood. Speaking on the occasion, Km Soumya commended the spirit of faith and devotion of Nirankari devotees and said that by organising these camps, the Sant Nirankari Mission is making unique effort to bring man closer to man. She said that devotees of the Mission do not participate in blood donation camps only, they are making an outstanding contribution in other social welfare activities also. Addressing the gathering, Dr. B.S. 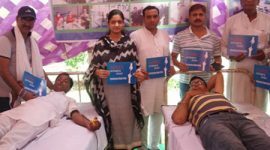 Cheema, Zonal Incharge, Chandigarh asked the devotion to keep on donating blood from time to time because it gives a new lease of life to the patient who receives it. Dr(Smt.) G.K. Cheema, Additional Zonal Incharge, Chandigarh and Shri Sohan Lal Bassi, Kshetriya Sanchalak were also present. The local Mukhi Siya Ram thanked the Chief Guest, donors and Sadh Sangat.